The third vessel in the Majestic Line fleet, Glen Etive was built by the Ardmaleish Boatbuilding Company on Scotland's Isle of Bute -- where a fourth vessel is being constructed to launch in 2019 -- and entered service in April 2016. Like its current two sister vessels, Glen Etive is 85ft in length but more spacious internally due to the steel exterior. 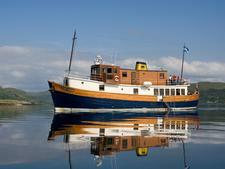 Similarly, Glen Etive is finished in traditional wood and brass and crowned by a varnished wooden wheelhouse. A crew of four look after all the requirements of passengers. Glen Etive accommodates 12 passengers in seven double cabins -- one cabin is on the main deck and six on the deck below. The number of people accommodated on any sailing is usually a maximum of 12, and there is no single supplement. Beds are configured either twin or king-size and each has freshly laundered duvets, plenty of pillows and tartan rugs for extra warmth. There is a small wardrobe, plus limited storage space under the beds. Each cabin has a small shower room with a toilet and washbasin, Arran Aromatics toiletries and a hair dryer. Uniquely on Glen Etive, the dining saloon is located at the stern of the boat and a combined lounge, bar and library at the bow. Passengers dine communally at a long table, and breakfast is a hearty affair while lunches are kept on the lighter side. Dinner is the main event and the crew dress the table to reflect this; the menu boasts the finest fresh ingredients from Scotland's larder and is of consistently high quality. Excellent wines are complimentary at evening meals, and there's a keenly priced bar for drinks; soft drinks and water are complimentary. Tea and coffee are available whenever a crew member is in the galley, but there is also morning coffee and afternoon tea with home-baked cakes depending on the itinerary and whether or not passengers are out on excursions. Aft of the saloon is a small wooden deck with a table and chairs, and there are wooden sun loungers on the top deck, with seating on the small fore deck. Each cruise provides passengers with the opportunity to get to destinations that larger cruise ship can't access, with itineraries around Argyle's coastline, the Inner Hebrides and the Western Isles. Glen Etive offers 10-day voyages to Islay, Skye, the Outer Hebrides as well as the remote island of St Kilda. 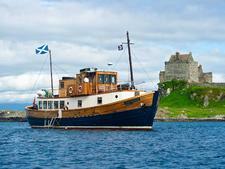 At the beginning and end of each season there are six-day cruises to Skye and the Small Isles. All departures are from the port of Oban on Scotland's Argyll coast and the season lasts from early April to late October.